LAURIE BAUM was a very generous and active member of the Southern California Hammered Dulcimer community and specifically worked hard for SCDH and West Side Hammered Dulcimers. He developed a passion for hunting down, researching and restoring historic hammered dulcimers, giving them second lives, and donating most of them to SCDH for Dulcimer Rescue and resale. Sometimes, hammered dulcimers found him, and he repaired instruments that others had declared unsalvageable. He always tried to learn stories of their former lives and owners. To Send for a Memorial Service. Laurie played his HD on this recording. 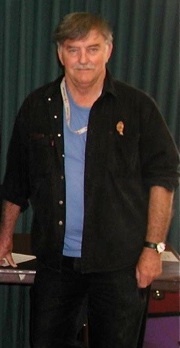 LAURIE was a founding member of West Side Hammered Dulcimers, joining Nov. 14, 2006, and sharing ‘Brian Boru's March’. At West Side sessions Laurie was generous to everyone - providing a copier, water, recordings of shared tunes, keeping a tune archive, and providing information on many topics, hammered dulcimers and instrument accessories. He also participated in hammered dulcimer workshops at CTMS Summer Solstice Festivals since their beginnings and formed friendships with many other players over the years. 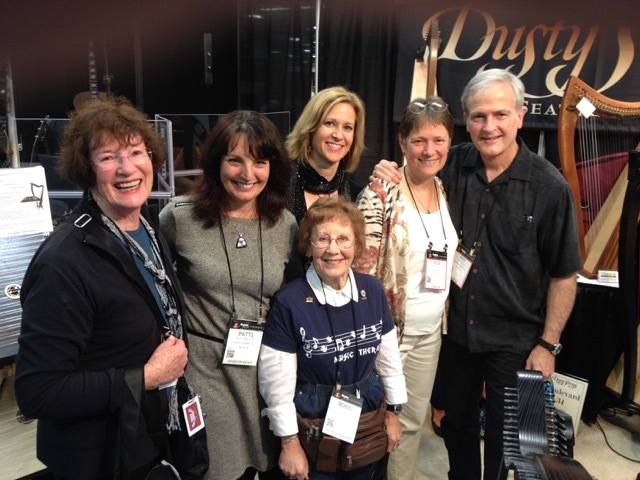 Bobbi and Barbara stopped by to thank the folks at the Dusty Strings Booth at the 2015 NAMM Show in Anaheim for their wonderful generosity in donating a Hammered Dulcimer each year for the instrument fundraiser at each SCDH Dulcimer Festival (21 YEARS!!!). Patti was working at the booth and is a local rep for Dusty Strings. THANK YOU, RAY & SUE MOOERS!!!!! Best of One to One Showcase for Projects at the Apple Store in Costa Mesa. www.scdh.org website. 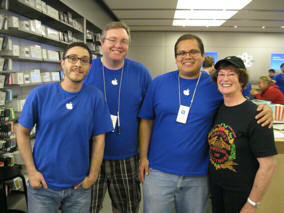 Big thanks to all the Creatives at Apple for their help!! 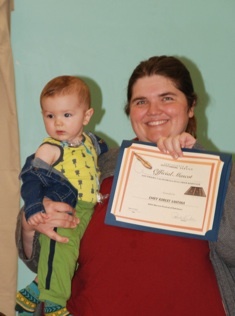 We’re sure that Emry will have a musical future with Kyla’s loving influence as a fretted dulcimer and trombone player, music and occupational therapy career, and her long-time service as a SCDH board member. Welcome to our SCDH Assistant Mascot! Thanks to Autumn for being our valued SCDH Secretary and then the SCDH e-calendar organizer. She retired so that she can spend more time with Drake - and even play her hammered dulcimer - sometime. She’s always on call for Techie advice.